In a large bowl mix 1 cup sugar, baking powder, salt and nutmeg. Add eggs, milk and melted butter. Beat well. Add 3 cups of the flour, beating until blended. Add one more cup of flour and beat well. The dough should be soft and sticky but firm enough to handle. If you feel its necessary, add up to 1/2 cup more flour. Cover with plastic wrap and chill for at least one hour. Remove your dough from the fridge and begin heating about 1″ of oil to 360F in a large metal skillet. Mix 1/4 cup sugar with the cinnamon, set aside. Working half the dough at a time, roll it out on a floured surface to about 1/2″ thickness. Cut out circles using a doughnut cutter or large biscuit or cookie cutter, and a smaller circle for the center. 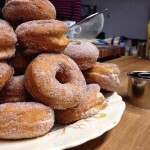 Gently drop the doughnuts in batches into the hot oil. Flip them over as they puff and turn them a couple more times as they cook. They will take about 2-3 minutes in total and will be lovely and golden brown all over. Remove from the oil and set on paper towels. 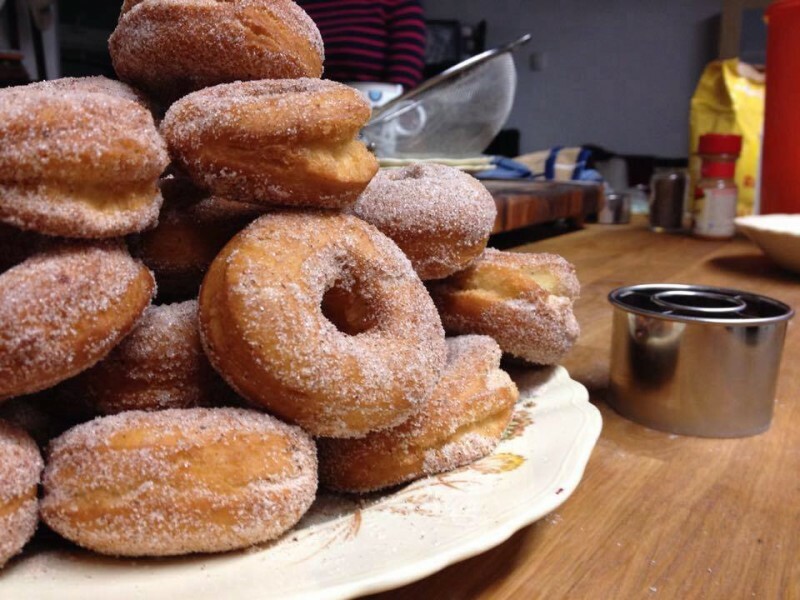 Flip each donut in the cinnamon sugar mixture right after frying so the sugar sticks. I wasn't sure how long to cook the donuts for, and ended up making them a bit on the dark side (see donut photo at top of page), and weren't quite as soft as I wanted. Make sure to take 'em out early!